ARTURO apartment located at ground level on the west side of the main house. your vehicle, place them under a reserved pergola, which gives additional shade. they reach their parking lot by an automatic gate, the remote control they receive at their arrival. 15 meters further north you will find another large terrace (22 sqm) with table, chairs, lounge chairs, parasol and a magnificent view of the pool and the surrounding hills. Both terraces belong exclusively to app. ARTURO. large living room with open kitchen, extractor with external subtraction, dishwasher, refrigerator with extra freezer, 4 ring ceramic hob. dining table for 4-6 people. comfortable sofa that can be converted with a handle in a sofa bed 160 x 200.
bathroom with a large, walled shower with glass door. the app. LOFT FIENILE (terracotta colored building - photo 3), see the object number 2003402 !!! ATTENTION: the other object number can be selected directly from this page. Please go to the home page of www. HomeAway. de. because in the middle: WHERE `s go? as they give us the object stupid 2003402, without specification of deadlines. then they are right on my side. the app. EMMA ARTURO can by opening a soundproof sliding door to the app. TOTAL be placed together. TOTAL then offers 8 sleeping places !! 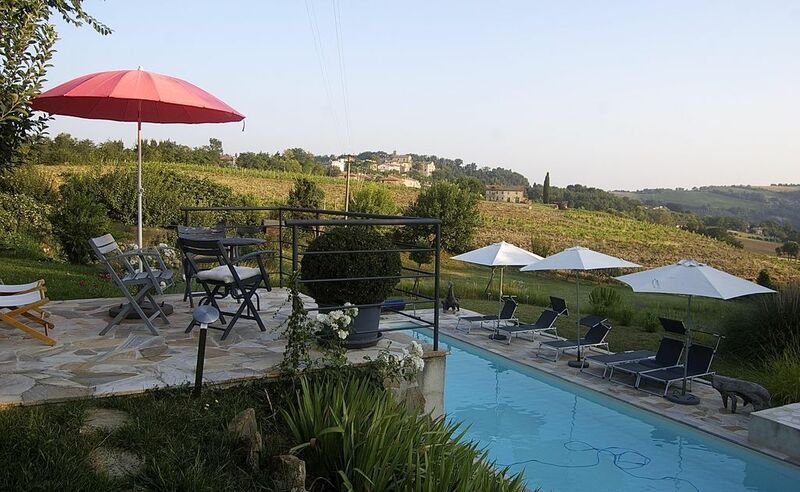 CASA NOCI is nestled between a vineyard and a walnut plantation, with a more glorious view into the hilly landscape and the small village MERGO, which is beautifully illuminated at night. all buildings were obtained from 2006 - 2012 lovingly restored and at the same time equipped with the latest technology. the OLD BUILDINGS in the style of its time, the facade partly in faccia vista. handmade cotto floors, holztravi, arco, etc. CASA NOCI is quiet on a small street, but close to the village. walking in 10 minutes by car or. 2 Find on the village square a grocery store, which is already open from Mon-Sat at 7 clock, a post, a trattoria with cash and an osteria. the next entrance to the fast road SS 76 is only 3 km away, down in VAL D'ESINO and therefore fulfill the beach of SENIGALLIA in 35 min., the AIRPORT ANCONA in 25 min. reach. to the beautiful MONTE CONERO, the steep coastal south of Ancona with many, sometimes lonely booked, it was about 50 min. within a radius of 3 to max. 10 km find countless supermarkets as well as any special transactions. lie in the immediate environment many small and larger-traffic locations with CENTRO STORICO, the historic old town. JESI, FABRIANO, MONTECAROTTO, Serra San Quirico, CORINALDO, Macerata, etc. in the center of SENIGALLIA with the big market (daily mo-sa, the really big MARKET is always on thursday) and a lively old town center drive comfortably in 45 minutes. day trips by ANCONA, URBINO (world heritage site), Fermo, CAVE DI Frassasi are worthwhile goals. after GUBBIO it is only 1 hour by car., to beautiful Ascoli Piceno is about 2 hrs. cultural offerings here are respectively set to date. a lot of material to be found here on the spot. all residential units have floor heating. living rooms and bedrooms each with 2 separately adjustable thermostats. We heat with a GEOTHERMAL HEAT PUMPS HEATING. the power supplies mainly to the roof of the integrated fienile PHOTOVOLTAIC - APPENDIX. This water-efficient type of heating - without any fossil fuels - allows us to apartments in the cooler months - to offer - WITHOUT HEATING AWARD. fireplace-wood stoves (stoves Nordic) in each apartment then bring more cosiness (instead of open chimneys). with all German programs and access to wireless Wireless Internet access is complimentary. 15m x 4m, with stunning views of the village. There are sufficient and parasols. Freshwater - solar shower. The pool is usually open from mid-May to mid-October. if the weather permits, even earlier, respectively. longer. a charcoal WEBER GRILL BALL with div. accessories is available to all guests free of charge. grill briquettes and charcoal sacks can be purchased in 1 kg of here. the plant is small, it will max. 10 people staying here at the same time. the landlord live on the premises and are always with help and advice to imagine. they can smoke in the free course. CONSIDER ATTRACTIVE LONG-TERM rates from October 2015 !!! why the winter not even spend somewhere else ?? rest - think - sleep - write - paint - cooking - eating - hiking - strolling through the sites - etc. the late autumn and winter are very quiet, you can at the 13 km long and jogging at this time as good as empty sand beach of Senigallia hours, run, walk. excursions after RAVENNA, VENICE, ROME (by train in 2 hrs.! )SIENA, FLORENCE, PERUGIA, ASSISI etc. are on offer. All these places have a very special attractive in the winter months! The bathroom with window is not very big, but very functional and modern. toilet, sink, mirror cabinet. large, walled shower with glass door. separate electro-floor heating for the transitional time outside the heating season; heatable towel rail. PETS: not too big DOGS and only after consultation !!!!!!!! Die Ferienwohnung liegt in einer malerischen Landschaft und das Areal lädt zum Entspannen und Genießen ein. Wir haben uns so lieb umsorgt gefühlt, es blieben keine Wünsche offen und können uns weitere Aufenthalte sehr sehr gut vorstellen. Der Pool ist herrlich und die Terrasse ist ein ausgesprochen schöner Ort für lauschige Sommerabende mit Wein und gutem Essen. Vielen lieben Dank an Frau Schlaepfer für das tolle Erlebnis bei Ihnen. Es hat uns wie im letzten Jahr sehr gut gefallen. Tolle Unterkunft, interessante Umgebung und eine nette Gastgeberin die um das Wohl der Gäste besorgt ist. Und natürlich Paula, unsere Freundin auf 4 Pfoten. nette und zuvorkommende gäste, die die schöne anlage zu schätzen wissen und dies auch artikulieren. immer gerne willkommen !!! saluti nach erfurt ! Wir haben 2 wunderschöne Wochen im Appartement Arturo genossen! Traumhafter Blick von der großen Terrasse, gute Küchenausstattung, sehr bequeme Matratzen und eine unschlagbar prima Betreung durch Frau Schlaepfer;-) Täglich frische Feigen und leckeren Wein auf Bestellung! Es gibt viele, schöne Staedtchen zu sehen und in einer Stunde ist man am Meer. Wir bedanken uns bei Frau Schlaepfer und vermissen sie und den netten Hund Paula! Unser Aufenthalt im Arturo war auf Grund der Bilder von großer Vorfreude begleitet. Wir haben uns von der 1. Minute an sehr wohl gefühlt. Frau Schlaepfer hat von beginn an mit Rat und Tipps den Urlaub erleichtert. Wir haben viel unternommen aber noch lange nicht alles gesehen. Das werden wir beim nächsten mal vortsetzen. Sehr schön war es dann in die Ruhe und den wunderbaren Blick ins Umland zurück zukehren. Die Feigen zum Frühstück waren sehr lecker. Wir (2 Erw., 1 Kind) haben sehr schöne Ferien in den Marken verbracht. Das Appartement Emma hat uns sehr gut gefallen. Es war alles vorhanden, was man so benötigt (inkl. Spülmaschine). Casa Noci ist eine sehr schöne und sehr schön gelegene Anlage. Pool ist vorhanden und super (15 m lang). Von Casa Noci aus kann man über die Schnellstraße zügig zum Strand kommen oder die schönen Städte in der Umgebung besuchen. Die Vermieterin stellt im Vorfeld sehr wertvolle und ausführliche Informationen über Einkaufsmöglichkeiten, Restaurants, Wegbeschreibung, etc., zur Verfügung. Das war wirklich einmalig. "danke für die blumen !" schön, wenn sich die gäste wohl fühlen, das animiert zu weiteren verbesserungen und vielleicht auch zu einem weiteren besuch. es gibt noch sehr viel zu entdecken !! Wir haben mit drei Personen drei wunderbare Wochen im App. Arturo verbracht. Alles war von Anfang an perfekt vorbereitet. Restaurantempfehlungen, Einkaufsmöglichkeiten,an alles was einem den Urlaubseinstieg erleichtert, war gedacht. Arturo ist ein unglaublich gemütliches Appartement mit einer tollen kleinen Sitzecke, die etwas abseits vom Geschehen liegt und viel Privatsphäre bietet, wenn man das will. Die gesamte Anlage ist liebevoll gepflegt, man hat einen wunderschönen Ausblick in die tolle Landschaft der Marken und der große Pool ist während der sehr heißen Tage ein absolutes Highlight gewesen. Auch hier noch mal ein dickes Dankeschön an unsere liebe Vermieterin für die tolle Rundumbetreuung und für das Abschiedsesssen, das zwar stürmisch war, aber uns den Abschied noch schwerer machte. Wir kommen wieder!!!! MERGO lies in the brands, LE MARCHE, east of the Adriatic coast at the tuscany. capital is Ancona, mergo is located in the province of Ancona. LE MARCHE is characterized by a fantastic landscape, very small variety of fields, so to speak, a 'patchwork', as they say in Bavaria. rise of the Adriatic coast from more and more lovely hills conditions Apennines, the roads are all in the valleys, the narrow streets wind their curvy on the ridge and connect the places that stick like eagles' nests on the crests, with wonderful views. MERGO, located west of the hills. D'ESINO along the VAL, the valley between Ancona and Fabriano. on the fast road SS76 to reach from the motorway exit A14 ANCONA NORD exit the MERGO in 25 minutes. From there it is only 3 km away from the front door. thanks to this good verkehrsabindung are ANCONA with its impressive harbor, or Fabriano, the ancient city of papermaking, within reach soon. please read the many reviews of enthusiastic cyclists !! Card material can be provided. GOLF: Golf Club Conero-Sirolo, about 60 km, on the superstrada SS76 and a short distance on the motorway A14 south (one exit) in just 50 min. to reach. 18-hole plus 9-hole. open throughout the year.